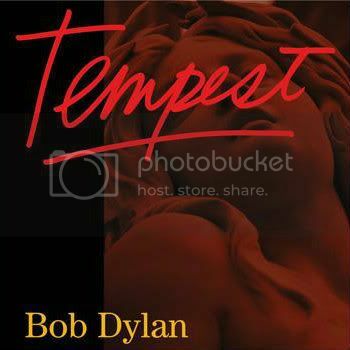 The legendary Bob Dylan will release his 35th album on September 11, Tempest. The 10-track set is once again produced by Dylan himself (under his Jack Frost moniker) and is the first proper follow-up to his 2009 album Together Through Life (he released a Christmas album in 2010). Bob Dylan released his self-titled debut in 1962 so like The Beach Boys and Rolling Stones, this is a 50th Anniversary release but it's not a compilation, it's an album of all new material. Now I'm going to need you all to try and suppress your shock when I tell you we don't know many specifics about this new album from the greatest songwriter of all time. We have a tracklisting, artwork and a release date. Everything else will be speculation, so that's what we'll do. Let's start with the artwork here for a moment. I heard rumors a new Dylan album was coming but hadn't seen confirmation of it until BlindedBySound correspondent and my ace co-pilot 11 sent me word last night. In his words, the artwork looks like one of the covers to his weird '80s albums and I'm hard pressed to disagree. As for the title, pretentious pseudo-intellectuals are probably writing their reviews today without having heard a note drawing comparisons between Dylan and Shakespeare. Shakespeare is the original Bard and many have taken to referring to Dylan with that same title. The critics will either fall over themselves slobbering about Dylan's genius or they'll get their knives out- Dylan has endured both. I'm hopeful there will be an iTunes/Amazon pre-release single; I'm very excited to hear music from the record. His latter-day work has been largely excellent and it's a bit unfair, really (warning: here's where I slobber a little bit). He's been the best for so long and by such a margin it almost feels like he's piling on with the great songs he's written on albums like Time Out Of Mind, "Love & Theft", Modern Times, and Together Through Life. As always, he's out on tour and it won't be long before these songs start making their way into his setlists. I've only seen Dylan once and it was incredible; I only wish I could go back in time and see it again as I've become far more familiar with his work and some of the songs he played that night since that show (here's the Novemer 3, 2011 setlist for his show at Nashville's Municipal Auditorium). As for the tracklist, I don't plan on taking any sort of guesses as to what these songs might be about or what be on the mind of the great one because he's been adamant his songs are not about him and they aren't about anyone else, either. In fact, they may not even be songs. Your guess is as good as mine. I'm still excited about this.